When writing about crime and courts, powerful storytelling is essential. The use of narrative techniques and vivid detail opens the door for readers to experience more than just another example of a broken clause in the social contract. It allows one to discover the individuals, families, and relationships that are affected by a crime. Cathy Frye’s “Caught in the Web: Evil at the Door” displays the way in which “exhaustive reporting” contributes to the power of narrative. Her ability to tell the story of 13-year-old girl Kacie Woody’s kidnapping in 2003 is due to the numerous interviews, observations and records she collected. Such a depth of reporting serves as a foundation for a gripping yet personal story. Some of the most powerful crime narratives include information about what may have caused the individual to pick up the gun or break into the store. An article run in the Seattle Times in 2009 titled “Four days in May set stage for tragedy” tells the story of Maurice Clemmons and the days leading up to the murder of four police officers. The newspaper’s staff explicitly highlight the four days prior to the murders in which Clemmons’ state deteriorated significantly. The use of details and subheads allow the reader to see beyond the crime itself. Similarly, “Friends Saw Anger Growing in Beck” by staff members of the Hartford Courant illustrates the way in which reporters can move beyond an event itself and peer into the life of individuals who break the laws we have in place. The story highlights the change friends and family saw in Matthew Beck’s demeanor in the time leading up to the shooting of four lottery officials. Variation in sentence structure is also telling in stories that involve crimes. “Pop, Pop, Pop’: Students Down, Doors Barred, Leaps to Safety,” a story about the Virginia Tech shooting in 2007, includes several two-word sentences and short phrases that help set the scene for the event and move the story along. Stories often have an impact when an anecdote from the time of the crime itself is used. It not only draws the reader into what occurred, but it also transports the reader to the crime scene itself. A 1998 article by Angelo B. Henderson titled “Crime Scene” does just that. 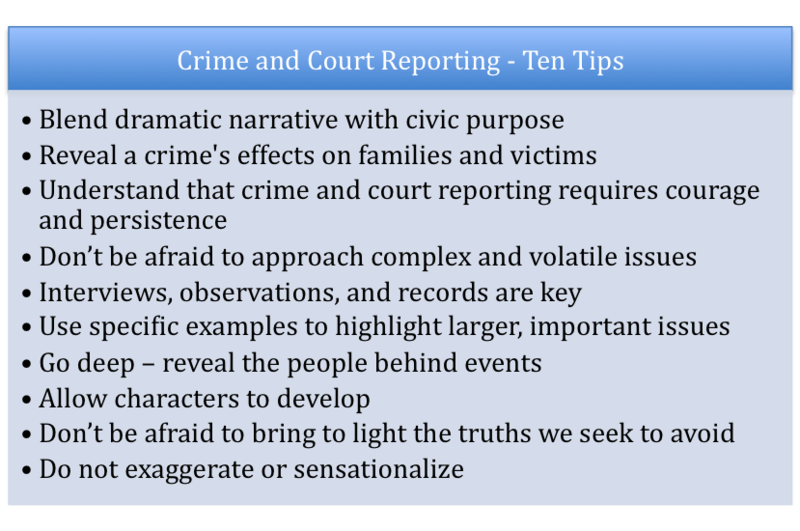 Whether breaking a story or writing a follow-up piece, narrative tools and elements can lead readers to recognize the impact of the crime on all parties involved and reveal the pieces of a criminal’s life that are often overshadowed by the crime itself. Criminals become humans, their lives in many ways a tragedy.